Snake chains are made from sheet, not wire. These are sleek, tubular cords of metal. Snake is contructed from thin, cut sheet plates for a solid appearance instead of the open links in most jewelry chains. Snake chains should be used with care. 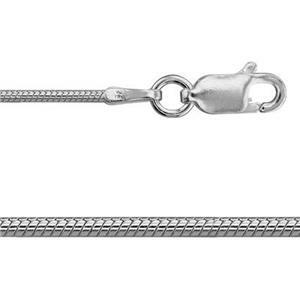 It is possible to permanently kink these chains if you push their flexibility too far. Snakes are beautiful luxury chains. They are heavier weight with a polished contemporary style. Snake neck chains are some of our best sellers. Our pricing is fantastic! Retailers who purchase these items for their stores also frequently buy our sterling silver rings line.